I love blogging. I think more brothers should blog because of just how much fun it is to chat with brothers from all across the world. Ideas are exchanged that help your Craft grow and get better. That's why I'm happy to report that one of my best friends in Freemasonry is now a blogger. 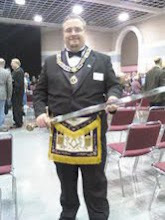 Worshipful Brother Gary Thomas is one of the Master Craftsman who raised Red Wing Lodge No. 8 from the rubble to be a beacon of Masonry in Minnesota. In fact, Red Wing Lodge just won the Mark Twain award from MSANA. Anyway, Worshipful Brother Gary is the LEO of Red Wing Lodge and has a lot of things to say about Masonry. So many things, in fact, that Gary need a channel to post everything he had in his head. I am happy to point out Gary's blog, the Speculative Mason. The first article is about an interesting video that he presented in one of his LEO talks. Go ahead and check out his blog. You will not be disappointed.